Ernest Moniz is coming to Iowa next month. Here’s why you should care. Energy Secretary Ernest Moniz greeting friends on his first day on the job, May 2013. Credit: U.S. Department of Energy. I’m not a fan of Bill Nye. I certainly endorse his science advocacy and education efforts, but he’s of my sons’ generation, not mine, and his lack of deep academic credentials leaves him open to the kind of challenge Sarah Palin recently made. (I’m not saying Bill Nye isn’t a scientist, as Palin did. I’m saying there are other science spokespeople with stronger resumes and greater accomplishments.) So I didn’t make a big deal out of Nye lecturing at Drake University April 14. 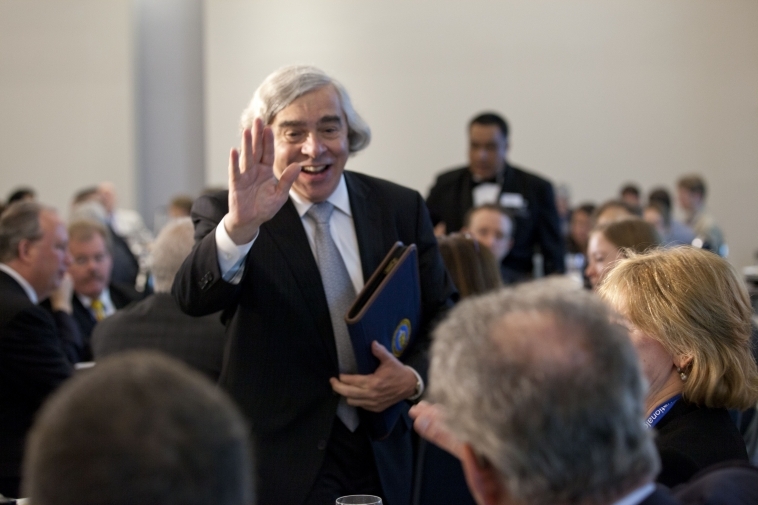 But I am excited about the pending visit of a real science superstar: U.S. Energy Secretary Ernest Moniz. He’s coming to Ames on Friday, May 6 to speak at the dedication of the Ames Laboratory’s Sensitive Instrument Facility. (I wrote about the SIF and the high-tech tools it houses earlier this year.) He’ll stay overnight and deliver the undergraduate commencement address at 1:30 p.m. in Hilton Coliseum on Saturday, May 7.